Daniel Anthony, the father of Susan B. and her siblings, was of such an independent mind that he married “out of Meeting,” i.e. someone who was not a Quaker. In fact, he married a girl who had been his student, a Baptist named Lucy Read. For this he was temporarily ousted from the Meeting, as he was at numerous other times during his life. This revolving door seems to be true for most of the Anthonys; eventually the Rochester-based Anthonys worshiped with the Unitarians, and Susan’s brother D.R. ceased to be a regular churchgoer altogether. But they never lost their devotion to that inner light they held so dear. Susan in her authorized biography by Ida Husted Harper recounted how her father abstained from liquor. Like many merchants in their town, he sold liquor until one night a man was found frozen to death with an empty jug by his side. “Although Mr. Anthony had not sold him the rum, he resolved . . . to sell no more.” Later, when a business partner advised Daniel that he’d need to provide gin to get support for a house-raising, he stubbornly but successfully carried the day by serving lemonade instead. Susan espoused this attitude so wholeheartedly that she joined a band of temperance speakers and turned down at least one proposal because her suitor drank liquor. Imagine the family’s consternation when an early letter from son D.R. described his enjoyment of whiskey in Kansas! 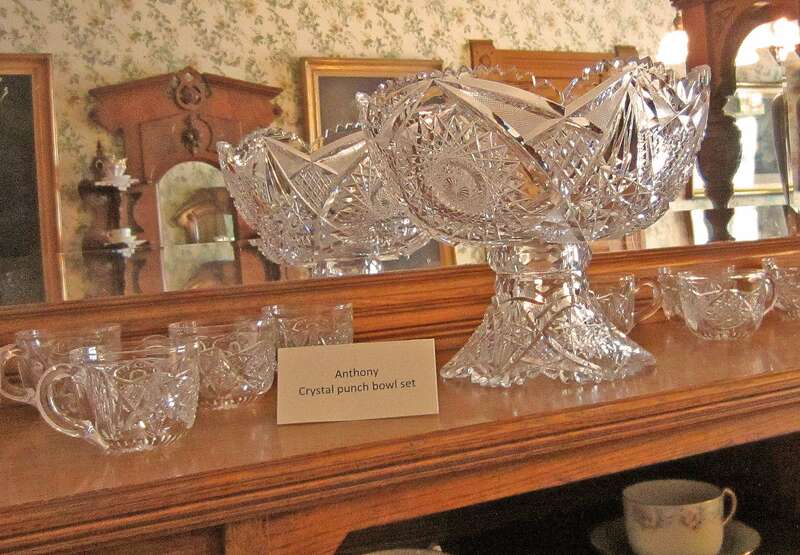 Indeed, D.R.’s memorabilia displayed by the Leavenworth County Historical Society included a lovely cut glass punchbowl set. The elder Daniel was also a pacifist in his early years, protesting his payment of taxes to a government that supported war. How distressed he must have been to learn that D.R. shot a man to death on the streets on Leavenworth, Kansas! Although D.R. was acquitted on the grounds of self-defense, the Quaker community back East required thorough explanations before allowing him to remain a member in good standing. It is perhaps a good thing that Susan’s father did not live to witness other violent encounters that punctuated his oldest son’s life. To date I have recorded at least nine times when D.R. exchanged shots or other forms of assault with men whose views differed from his own. D.R. kept the Anthony viewpoints on abolition, but he was far from a pacifist or temperance enthusiast. In my upcoming novel, The Truth About Daniel, he always follows his own lights, often at the peril of his personal safety and reputation. This entry was posted in Antislavery, Daniel Read Anthony, Family Bonds and Differences, Parents Daniel and Lucy, Quakers, Susan B. Anthony, The Truth About Daniel and tagged abolition, Daniel Anthony, Daniel Read Anthony, Leavenworth County Historical Society, Lucy Anthony, Quakers, Susan B. Anthony, temperance, The Truth About Daniel by Jeanne. Bookmark the permalink.